Tran Trong Duyet - a sprightly retiree and amateur ballroom dancer - must rank as one of John McCain's more unlikely supporters. 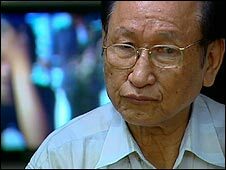 Four decades ago, during the Vietnam war, Mr Duyet was in charge of the notorious Hoa Lo prison - the place where Mr McCain says he was brutally beaten and tortured during five-and-a-half years as an American prisoner of war. "McCain is my friend," said 75-year-old Mr Duyet as he feeds the caged birds he now keeps in his garden in this coastal city. "If I was American, I would vote for him." Navy pilot John McCain was shot down during a bombing raid over the North Vietnamese capital, Hanoi, in 1967. 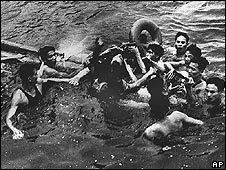 He ejected from his aircraft and parachuted into a city lake - only to be dragged out by an angry crowd, barely conscious, and with two broken arms and a broken leg. 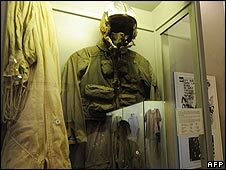 From there he was taken to Hoa Lo prison, known to its American military inmates as the "Hanoi Hilton". McCain has since described enduring months of solitary confinement and systematic torture which drove him to try to kill himself. "I don't know how he'd react if he met me again," said Mr Duyet, flicking through old black and white photographs of himself and his American prisoners at Hoa Lo. "But I can confirm to you that we never tortured him. We never tortured any prisoners." Mr Duyet reminisces instead about how he often summoned the future US presidential candidate to his private office for informal chats. "We used to argue about the war - about whether it was right or wrong," he says. "He is a very frank man - very conservative, and very loyal to his country and the American ideal. "He had a very interesting accent and sometimes he taught me words in English and corrected my accent. I have followed his career since he left prison." So is Mr Duyet implying that that Senator McCain lied about his treatment at the Hanoi Hilton? "He did not tell the truth," he says. "But I can somehow sympathise with him. He lies to American voters in order to get their support for his presidential election." But Mr Duyet's propaganda-perfect version of events is impossible to verify - and should be treated with caution in a country where the Communist authorities still keep a tight control over the media. Relations between Vietnam and the United States have improved dramatically in recent years, following the normalisation of ties between the former enemies in 1995. Mr McCain played a crucial role in bringing about that initial rapprochement - a fact which helps explain Mr Duyet's enthusiastic support for the McCain presidential campaign. "I wish him success in the presidential election," he says. "Of course the Americans started the war in Vietnam and killed so many people - but now we want to leave the past behind. "So now I consider John McCain my friend because he did much to mend relations between our two countries. And if he becomes president he will do more to improve those ties."